Regardless of whether you’re in the city or in rural areas, chances are you’ll see residential mailboxes mounted on homes along the way. Even apartment buildings and manufactured home parks have lines of mailboxes used by the residents. Oftentimes it proves to be a dilemma when you consider installing a brand new mail box as there are a lot of styles, shapes and sizes to choose from. One of the things on the minds of many homeowners is basic safety of their mail. Even though most identity thieves have turned to the internet to latch on to sensitive information, some of the old-fashioned thieves still rummage through mail boxes looking for something that may help them in their attempts to steal anything worthwhile, including private and personal information. Quite a few areas require a mailbox in order for the carrier to successfully make their delivery. When there is no box, no mail will probably be left, unless of course you have a postal mail slot. On walking routes, residential mailboxes connected to the home make it simpler and faster for the mail carrier to do their job. On motor routes, letter boxes attached to posts near the street are the most commonly encountered. 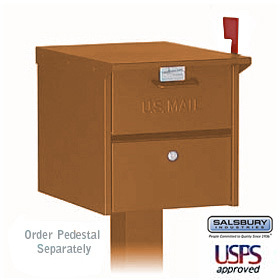 Today’s mail boxes are typically made from heavy-duty steel to prevent tampering and many choices are available for locking residential mailboxes. More people have an interest in locking residential mailboxes and they are available in numerous colors and styles. Despite the fact that there is the possibility that a identified thief will take enough time to bust into a mailbox, locking mailboxes offer a higher level of security as most thieves will not spend the time necessary to break into them while sitting on one side of the road or on someone’s front porch in plain sight. Depending on the amount and type of mail you get, the size of your letterbox can either be a handy thing or a hindrance. Large mailboxes are on the market for those who regularly receive small parcels that won’t usually fit into standard-size mailboxes. It doesn’t matter what kind of mailbox you want to install, if your choice is not approved by the USPS, your mail isn’t going to be delivered. Therefore, visit the USPS web site or your local postal center to get a personal copy of the USPS mail box restrictions and rules before choosing to purchase or put in a new mailbox.